There are a few things that I absolutely love. Of course I love my family and friends. The people that are there for you through thick or thin. You can show up to their doorstep on a Sunday morning and know you will be welcomed with an embracing hug, a warm cup of tea, and a compelling conversation. You can call them for hours in the middle of their work day just to laugh about something crazy you saw or work through the confusions of life. They walk with you on your journey of life, even though they are not compelled too. I love the lessons I have learned throughout my life, the thought of the future, and of course everything the surrounds me today. Although life can throw some curve balls which make you fall to your feet, I love how our bodies have this astounding ability to heal, grow, and continue to progress on. It is quite an amazing ability that is often times overlooked. I love the warm feeling of the sun on a cozy spring day, the way the sun and moon never tire from playing chase around the earth, and of course the ways the stars look as you lay on a golf course in the middle of nowhere on a cloudless summer night. When you think of it, when you take a moment to imagine all of the beauties, the wonders, and the satisfaction that surround us each an every day, it is hard not to find something to love. Just take a moment to imagine the simple things in your life that you find fulfillment in, the things that are unique to your own awareness. Cherish these, never forget to admire these simple beauties that surround you each day, and hold them close to your heart. So a few weeks ago during spring break Allie, Amanda, and I decided to experiment with some cocktails. Each night we attempted to make a different one. And let me tell you, the all turned out great. 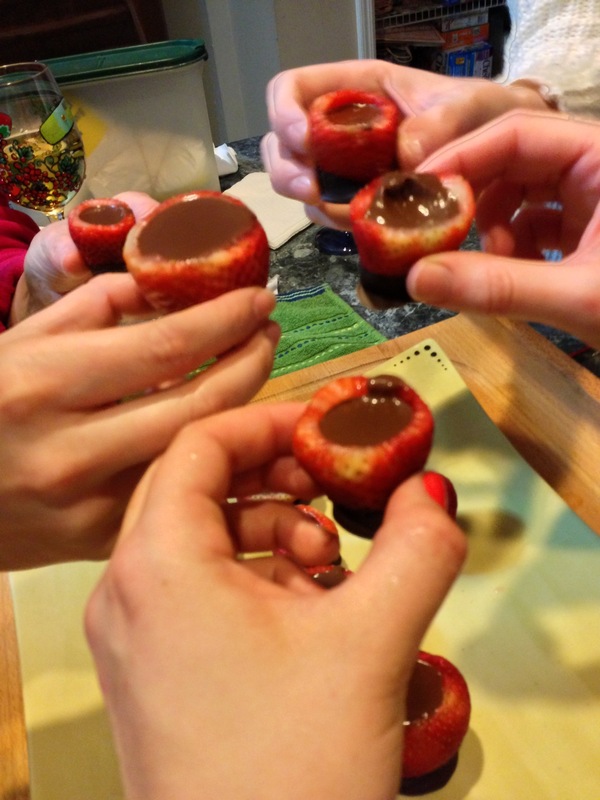 Here is one that we made which I thought you would like- I mean it has chocolate, strawberries, and liquor.. Whats not to love? I am not sure where we found the idea, I think it was something one of our friends had liked on Facebook. Either way, the second I saw a picture of the I HAD to make them! We didn’t follow a specific recipe, we just did what we thought would work. 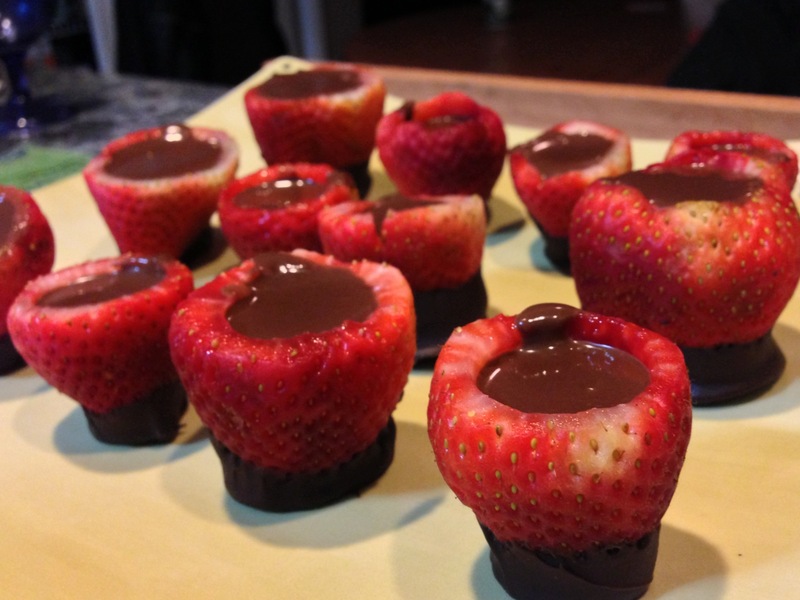 Make sure you wash them and the pat them dry- otherwise the chocolate wont stick. Prepare the strawberries. To do this first wash them and pat them dry. Cut off the tops and a small bit of the bottom point to make a flat bottom. 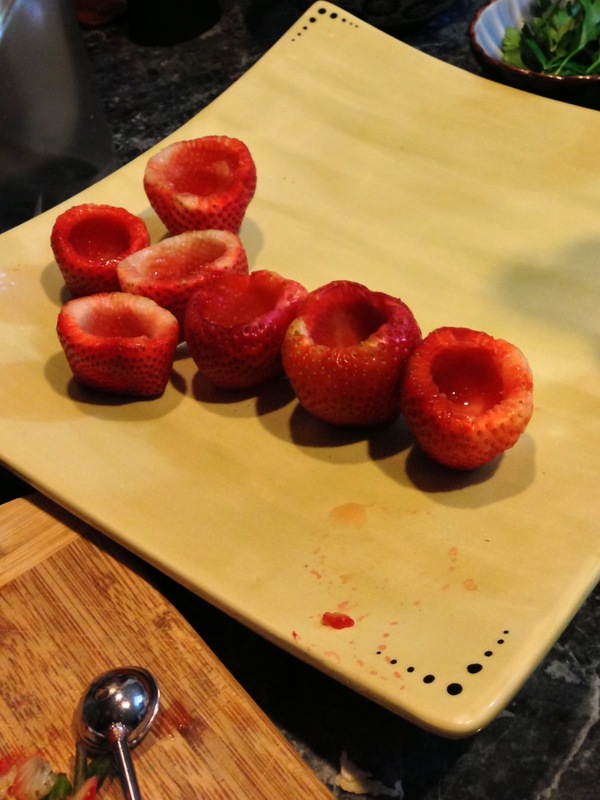 Using a small melon scooper, hallow out the strawberries. Be careful not to hallow out too much and cut through the outer flesh. 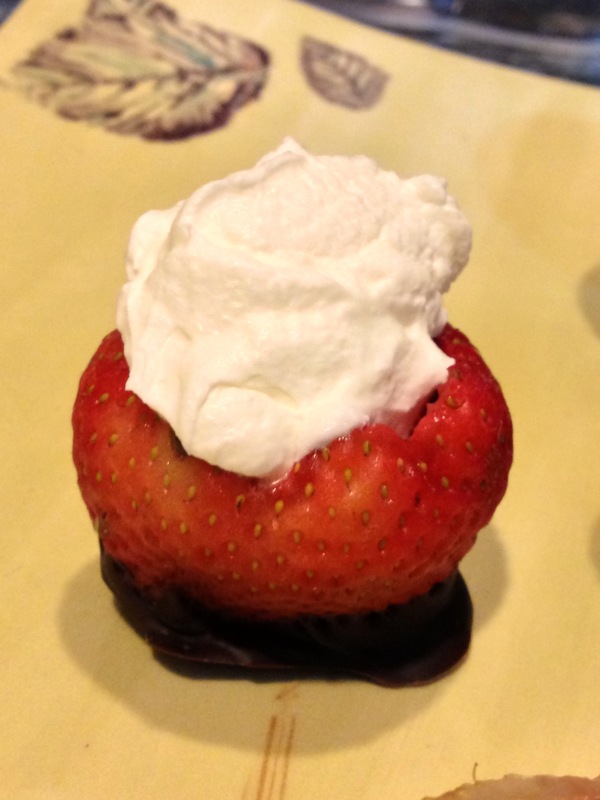 Dip the bottoms of the strawberries in the melted chocolate and place them on a plate covered with wax paper. Transfer them to the freezer while you prepare the rest of the ingredients. 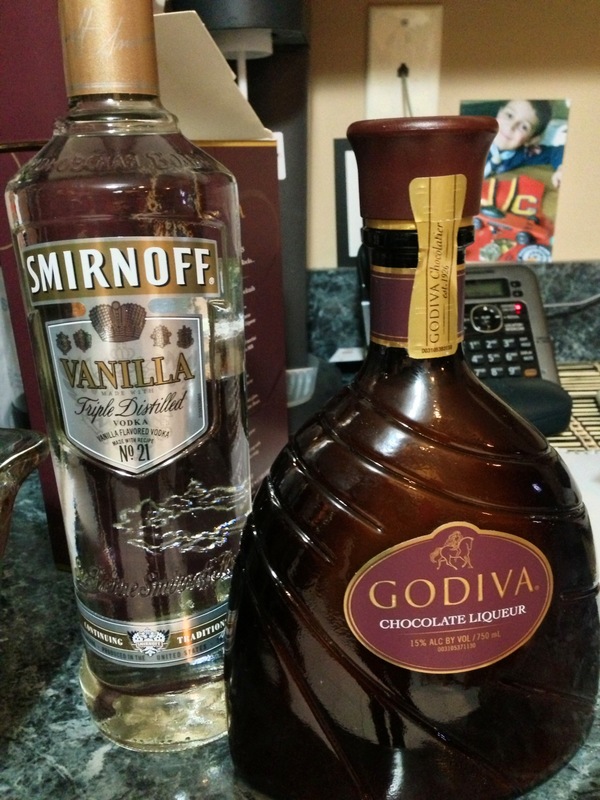 Mix equal parts vanilla vodka and chocolate liqueur. Mix in some chocolate syrup to your own preference. 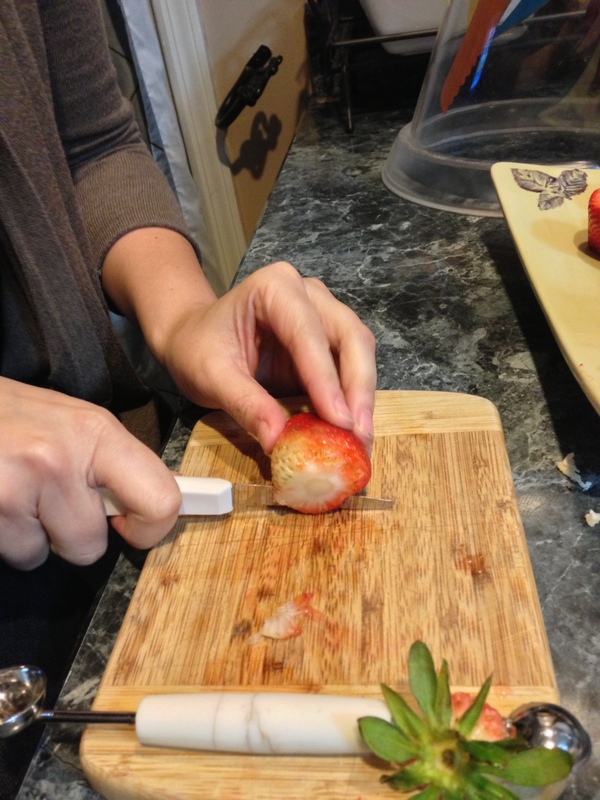 Remove the strawberries from the freezer. 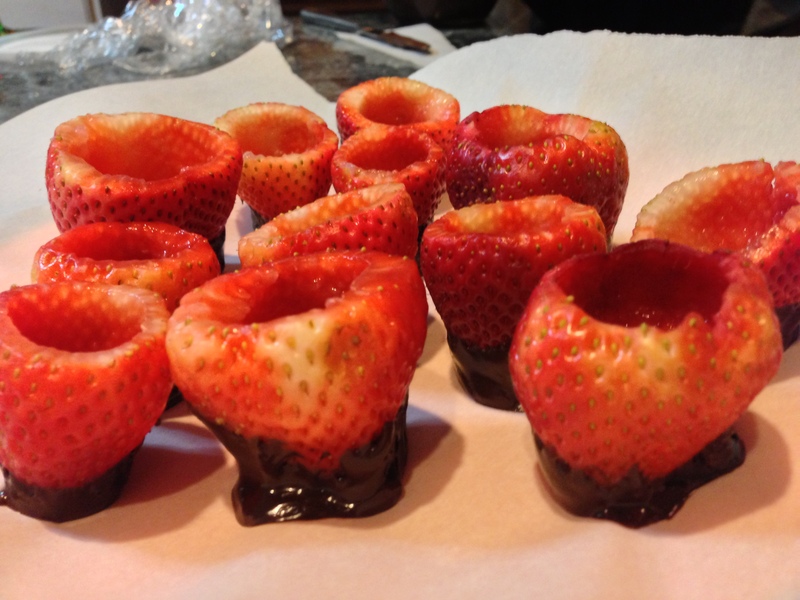 Pour the chocolate mixture into them and top with whipped cream. 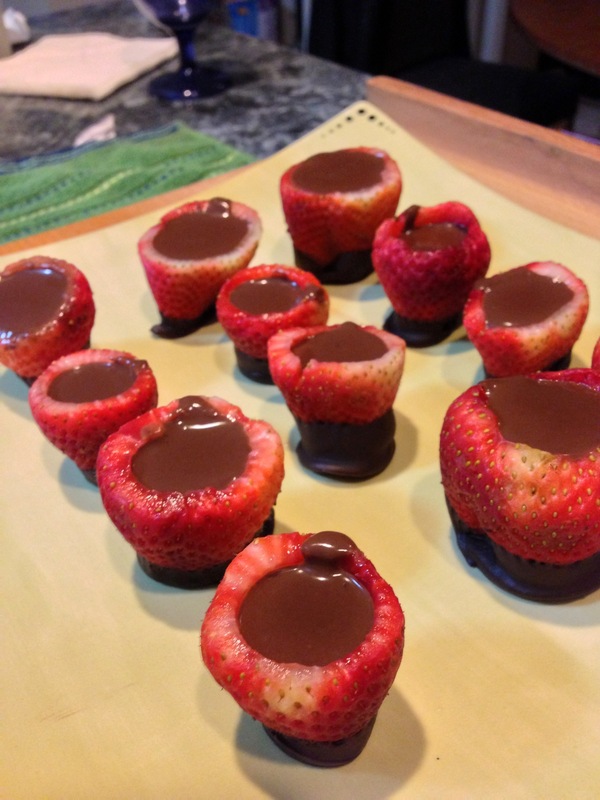 If you are making these for a party I recommended letting the strawberries sit in the freezer right up until a few minutes before the guests arrive. This way the shot glasses are sturdier and it helps chill the liquid a little bit. Decided to whip up some whipped cream a little later- Definitely worth it!